Teenagers across the region have been waiting anxiously for their exam results. Bristol charities have been providing a welcome distraction. Hints and tips to help children and parents through what can be a stressful exam period. Parents across the West Country are keeping their children out of school today. Many are choosing to turn their unofficial days off into educational days out. One mum from St. Austell took her children to a day of learning at the Eden Project. Sarah Pease is backing the "Let our Kids be Kids" campaign against testing for 7 and 11 year olds - which she says is asking them to become experts on subjects they'll never need. Parents are keeping their children off school for the day in protest at controversial tests for 6 and 7-year-olds. Strikes like this in Gloucester are taking place across the country. The action comes after more than 40,000 people signed a petition supporting a boycott of Year 2 Sats by teachers. 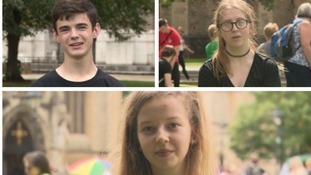 The 'Let Our Kids Be Kids' campaign has organised the day of action in protest at children being "over-tested, over-worked and in a school system that places more importance on test results and league tables than children's happiness and joy of learning". Speaking on Saturday, Education Secretary Nicky Morgan warned that missing school even for a single day would be "harmful" and called for those behind the "damaging" campaign to reconsider. Parents across the West are preparing to keep their children home from school this morning as part of unofficial strike action. Parents across the West Country are preparing to keep their children home from school this morning as part of unofficial strike action. It's in protest over Government plans to change the education system including turning all schools into academies and taking them out of local authority control. The parents involved are also arguing against too much testing in schools. 'Let out Kids be Kids' Facebook page. The action, promoted on social media, will see potentially thousands of children miss school with the threat of further strikes if the Government refuse to U-turn. To view where strikes are being held in your area click here. Parents have said they are pulling their children out of school for the day in strike action against the government. If you're nursing your teenager through the agony of exams you may be refreshed by a sixteen year old from Swindon who's taken a break from cramming to tell her peers that school is good!